From phytoplankton to the first fluorescent tree frog, light – bioluminescence and fluorescence – is a pervasive and fascinating phenomenon in nature. But glowing life has also proven to be a critical tool for the world of DIYbiology. 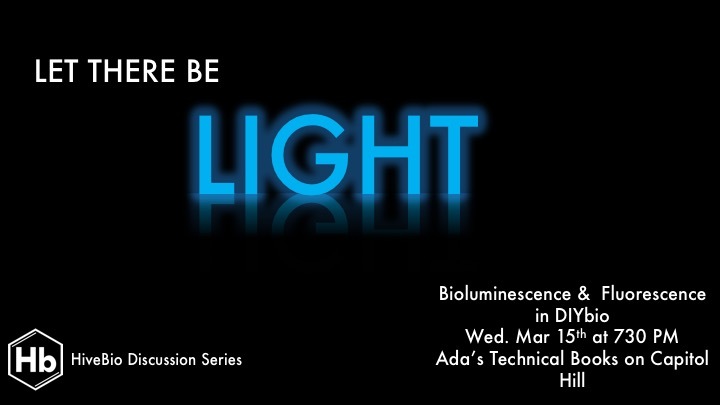 What makes life glow, why does it happen, and how does it stimulate scientific advancement? Joins us this week at the HiveBio Discussion on Wed, Mar 15th at 730 PM at Ada’s Technical Books (425 15th Ave E) to be part of the discussion. Did someone steal your heart this Valentines Day? HiveBios got you covered with a spare! 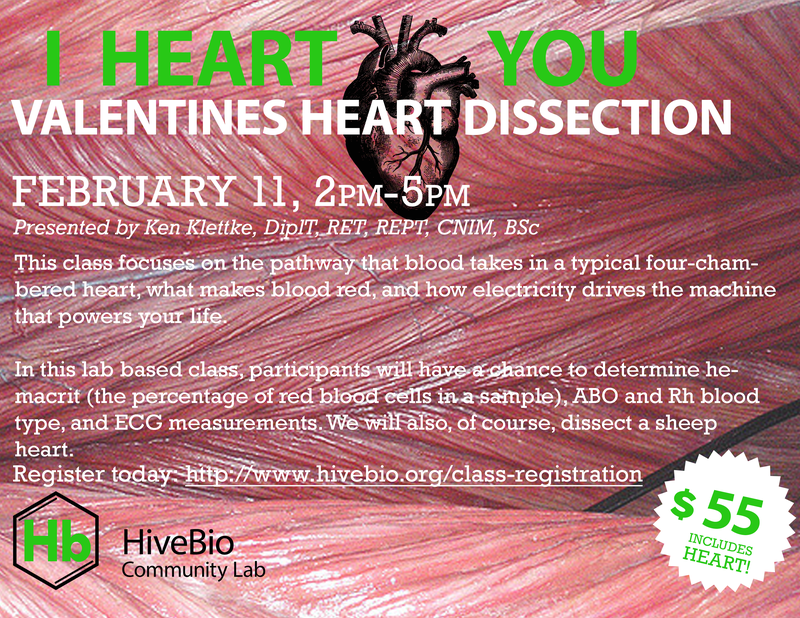 This Valentines Day, stop by the HiveBio lab for our Sheep Heart Dissection Class and learn more about Februarys favorite internal organ. This class focuses on the pathway that blood takes in a typical four-chambered heart, what makes blood red (or green, if youre a spider or a Vulcan! ), and how electricity drives the machine that powers your life. In this lab-based class, participants will have a chance to determine hematocrit (the percentage of red blood cells in a sample), ABO and Rh blood type, ECG measurements, and of course- dissection of a sheep heart. All materials will provided, and the class costs $55 for participant. Pre-registration for this workshop is required in order for us to have your heart ready for you. Register ahead of time to ensure HiveBio can give our heart to you! You can register by clicking this link to Brown Paper Tickets. Don’t forget to sign up for Molecule World this weekend! Did you know that the shape and structure of molecules have a radical effect on their utility and function? From proteins to DNA, long-chain lipids to small organic molecules, their composition and 3-dimensional structure are critically important to how they work, and what they do! In a class led by Dr. Sandra Porter, you’ll envision exactly how and why these structures matter. You’ll learn how DNA is put together by its properties, how mutant proteins cause albino cats, how protein folding dictates functionality, why some viruses are resistant to anti-viral drugs, and why some people develop diseases like breast cancer by use of Sandra’s 3D visualization program called Molecule World. After this class, you’ll be able to share your new-found love of biological formalism with a structural image of your favorite molecule printed on a T-shirt! 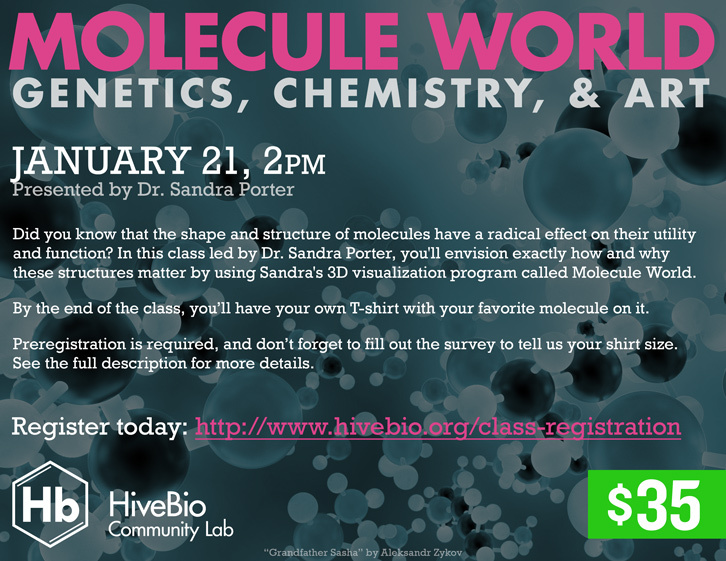 This class will take place at HiveBio on January 21, 2017 from 2-5PM. Pre-registration is required so we can ensure we order the right size T-shirt for you. Make sure you fill out the survey and tell us what size t-shirt you’ll need! – A white T shirt (optional). HiveBio will provide T-shirts, but if you want one that you know fits the way you like, get a blank cotton T-shirt and bring it along. – An iPad (optional). We will have some iPads available for the workshop, but if you have one, you might like to bring it. – If you’re bringing an iPad, download and install a copy of Molecule World ($5.99 in the iTunes store) before the workshop. Maximum class size is 10 $35 per participant. Please register on Brown Paper Tickets today so we know you’re coming! What is the line boundary humanity and technology, and what happens when we blur that line? Amal Graafstra, noted DIY body-hacker, has been pushing this boundary of body augmentation by pioneering practices in DIY radio-frequency identification (RFID) device implantation, allowing him to communication with the technological world around him. This month in the HiveBio Discussion Series, Graafstra will be discussing his journey in RFID-implantation and the future of human-technology interactions. Joins us this Wednesday, January 18th at 730 at Ada’s Technical Books (425 15th Ave E) to be part of the discussion! What will you do in 2017? 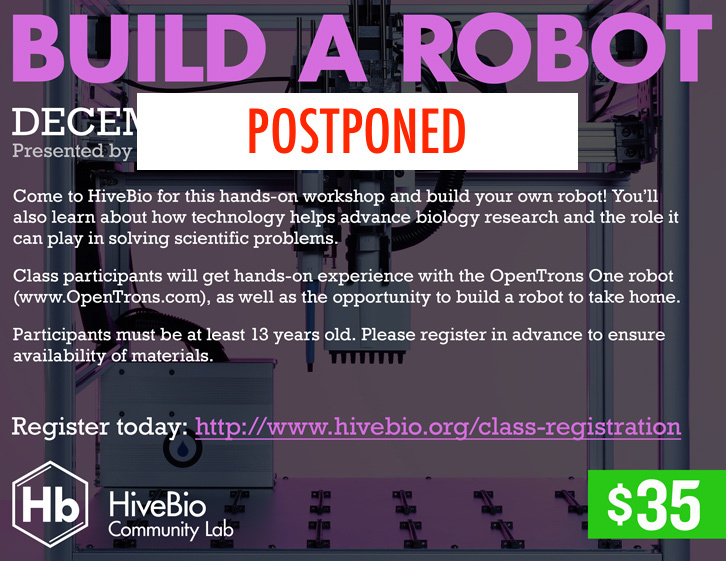 Missed your chance to sign up for our new Build-a-Robot class? Then great news – you’ve got another chance! We’ve decided to extended the sign up period for this class by offering it at a later date (yet to be announced). Our next class is on January 14th when we dive into the world of scent with Memories, Molecules, and Medicines. Click the link to sign up now! From robots to noses – check out our upcoming classes! Ever wonder how robotics can be used in science? In our modern world, automation is becoming more and more important in researc h and technology development. Even in the squishy sciences like biology, technology holds a critical and valuable place for researchers and enthusiasts alike. If youre interested in learning more about robotics, and how we can use engineering to help solve science problems in a hands-on workshop, with real robots and a fun take-home project! In this workshop, students will address the question: How can robots be leveraged in Biology? 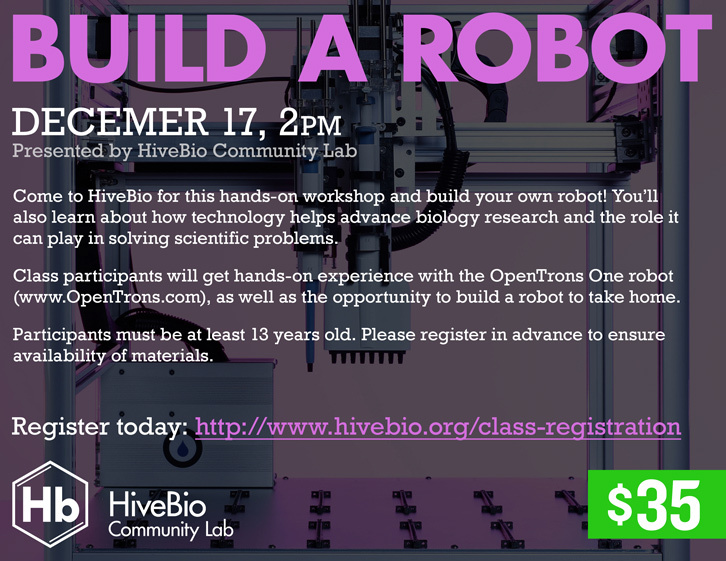 They’ll get hands-on experience with the OpenTrons One robot: https://opentrons.com/ Students can also expect to take home their own robot that they build at HiveBio during the workshop! This workshop is suitable for ages 13 and up. Pre-registration for this workshop is strongly advised so that we can ensure that we have enough parts on hand to make our robots. Walk-ins are accepted. Fragrances are ubiquitous in our environment – from plants and foods to cosmetics and cleaning products. 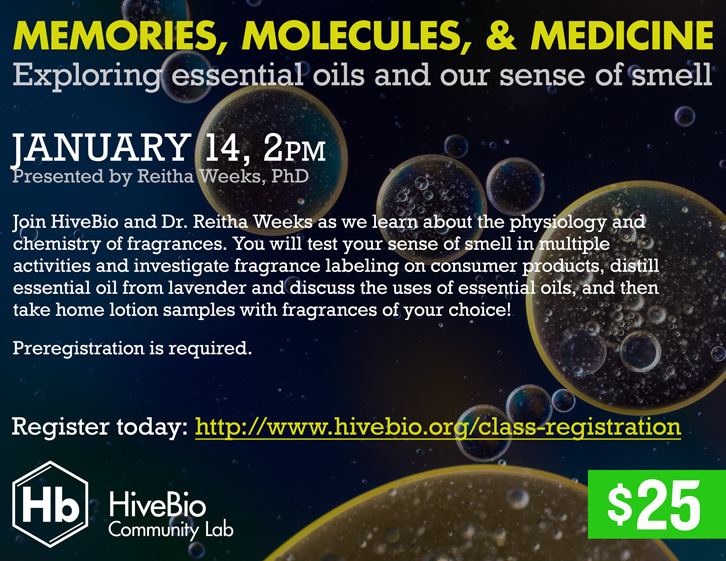 HiveBio invites you to explore the sense of smell and the molecules responsible for fragrances through this interactive workshop presented by Dr. Reitha Weeks. You will learn about the physiology of smell, test your ability to identify smells, investigate product labels and evaluate aromatherapy claims. Understanding the biology behind our sense of smell and the chemistry behind fragrances opens the door to the amazing world of fragrances and their uses. How can a favorite smell call up pleasant memories? Can a small change in a molecule’s shape yield a very different smell? What is an essential oil and how is it used? These are just a few of the topics that will be covered. You will test your sense of smell in multiple activities and investigate fragrance labeling on consumer products. Distilling essential oil from lavender will lead into a discussion about the uses of essential oils. You will take home lotion samples with fragrances of your choice. Maximum class size for this workshop is 9 students, $25 per participant. Pre-registration required to attend this class, sorry, no walk-ins! This class is not suitable for chemical or fragrance sensitive individuals. The subject matter for this class is above an elementary level, this class is not suitable for children under 7th grade. Please register on Brown Paper Tickets today! The holiday season is here! What better gift can be given but the gift of science? 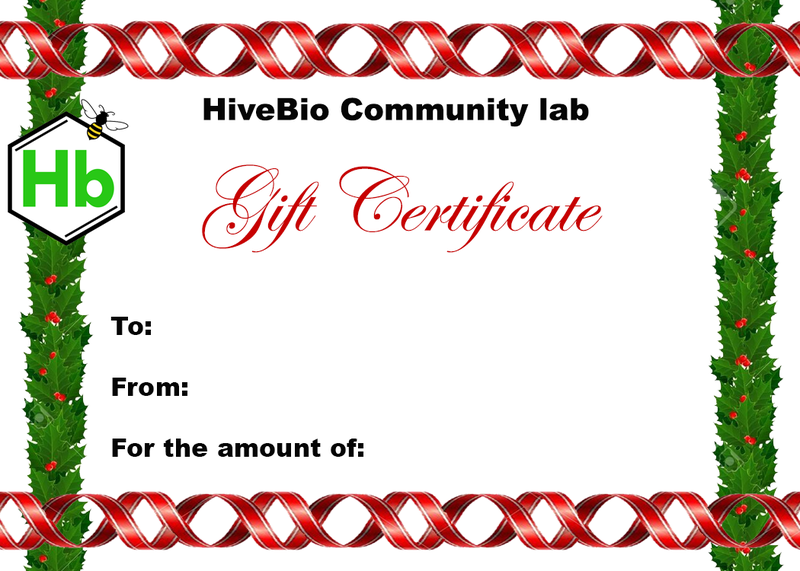 For the month of December, HiveBio will be offering HiveBio gift certificates that will be good for any upcoming class at HiveBio Community Lab. These gift certificates are valid for a whole year and can be purchased at any amount. Surprise someone this year with the opportunity to attend a hands-on science workshop of their choice! Gift certificates can be purchased by emailing info@hivebio.org with your name, the recipient’s name, and the desired gift certificate amount. Gift certificates can be emailed at no extra charge, or a physical copy can be “gift wrapped” and sent out via regular mail for an extra $6 charge. This includes shipping costs, plus the gift wrapping (gift certificates will be sealed inside a plastic test tube with a bow on top). Thank you for supporting HiveBio Community Lab, and for helping to proliferate science knowledge! A recent report suggests the rate of climate change may be even worse than we expected. Is there any thing we as biohackers can do about it? 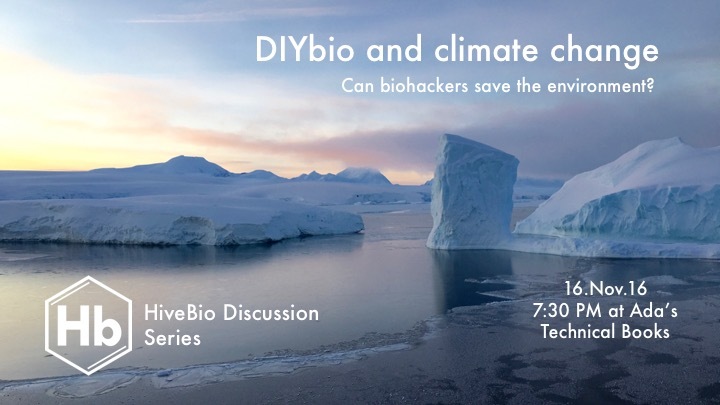 Join us at Ada’s Technical Books on Wednesday, Nov 16th at 7:30PM to discuss if DIYbiology has any role in fixing climate change. Hey DIYbio-ers! You may notice a lull of activity at HiveBio this evening – that’s because we’re all at home watching the election! Open Hours tonight are postponed , but we’ll see you next time!